Stata's commands are intuitive and easy to learn. Even better, everything you learn about performing a task can be applied to other tasks. Need to limit your analysis to females? Add if female==1 to any command. Need standard errors that are robust to many common assumptions? Add vce(robust) to almost any estimation command. Need to account for sampling weights, clusters, and stratification? Add svy: to the beginning of the command. The consistency goes even deeper. What you learn about data management commands often applies to estimation commands, and vice versa. There is a full suite of postestimation commands to perform hypothesis tests, form linear and nonlinear combinations, make predictions, form contrasts, and even perform marginal analysis with interaction plots. These commands work the same way after virtually every estimator. Let's start with linear regression. We fit a variety of models and explore results using the postestimation commands for testing, prediction, and marginal analysis. 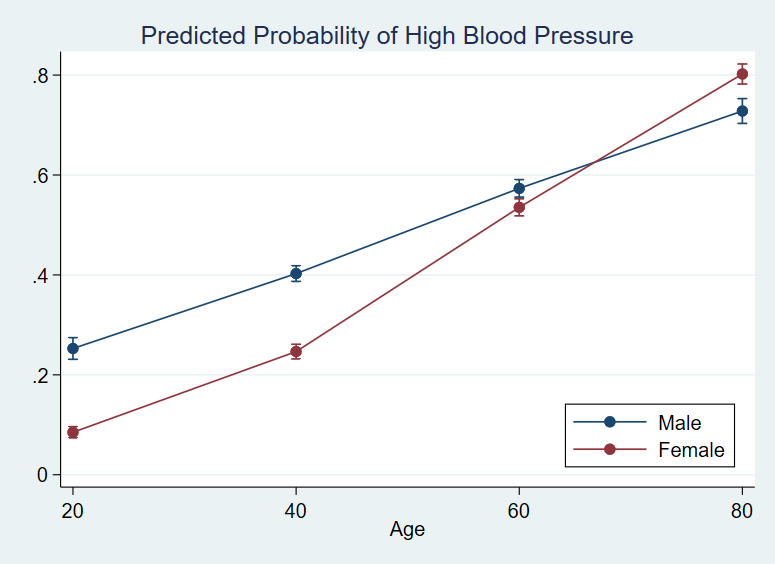 What if we instead have a binary outcome variable, an indicator of whether an individual has high blood pressure? We could fit a logistic regression model. 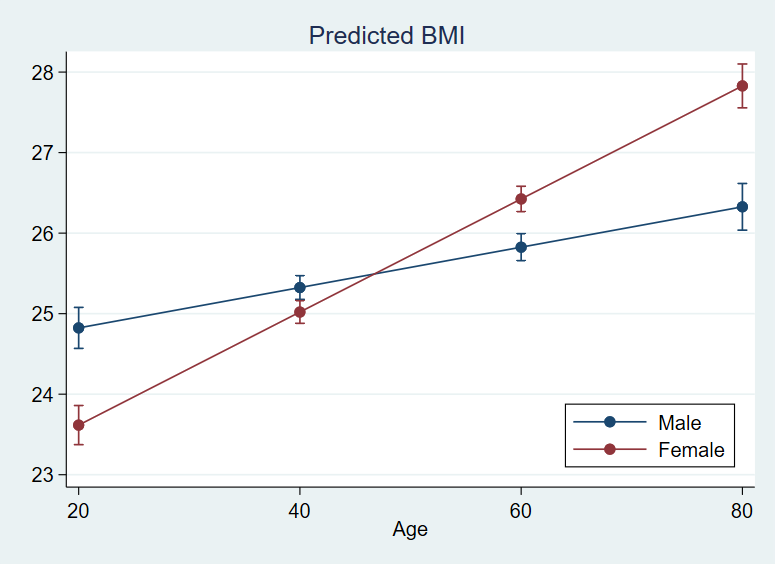 We replace regress in the commands above with logistic, and we use highbp instead of bmi as the dependent variable. Otherwise, the model specification, options, and postestimation commands are almost identical. 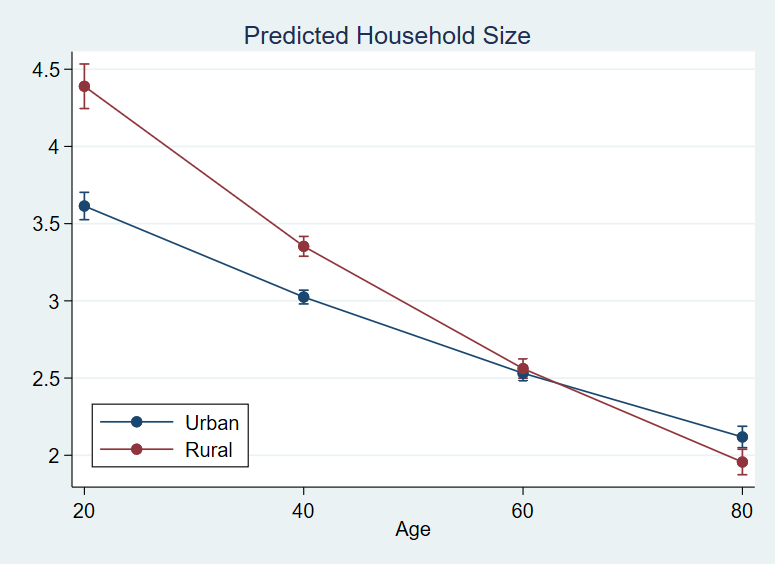 If we have a count outcome such as the number of individuals in the household, we might want to fit a Poisson model. We use the poisson command and housesize as the dependent variable, but again, the rest of the command syntax is the same. We could fit many other models. Models for ordered and unordered categorical outcomes. Multilevel models. Models for time-series, panel, or survival data. Models accounting for endogeneity and sample selection. Regardless of the model, we can use the same command structure, same options, and same postestimation commands that we used above. See the commands for fitting and interpreting linear regression models. Or watch the webinar. See the commands for fitting and interpreting binary, count, and other outcomes. Or watch the webinar.